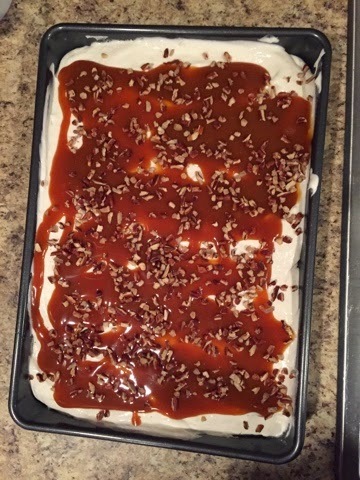 last year I made the delicious carrot cake poke cake and it was so good, that I made it for our family Easter dinner again! and this time I took a picture of it!! cool whip frosting is not the same thing as cool whip, but located right next to each other. I was able to find it last year, but it wasn't available this yer, so I don't know if they stopped making it?? anyways, I just made a basic cream cheese/cool whip frosting, and it was still delish... but what isn't when it has cream cheese! right?